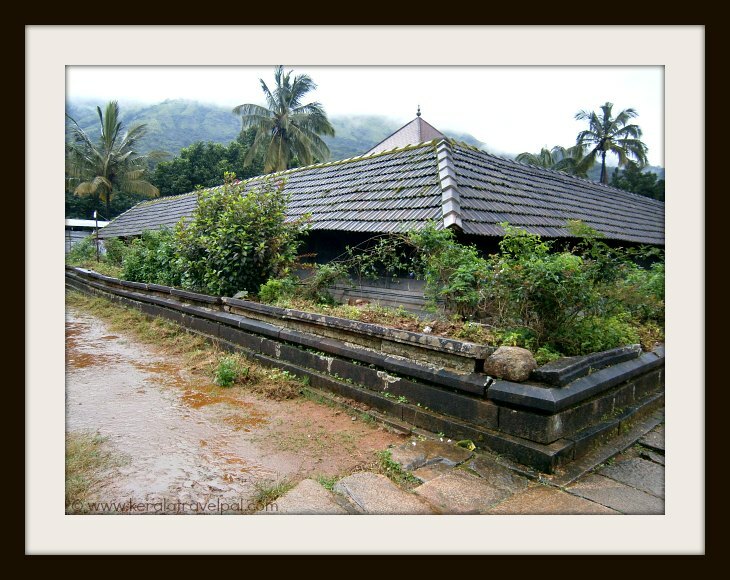 Thirunelli Temple, one of the notable tourist attractions in Wayanad, is located at the northern corridor, past Mananthavady town. Maha Vishnu Temple at Thirunelli is a highly sacred place for Hindus. So pilgrims greatly outnumber tourists at anytime. 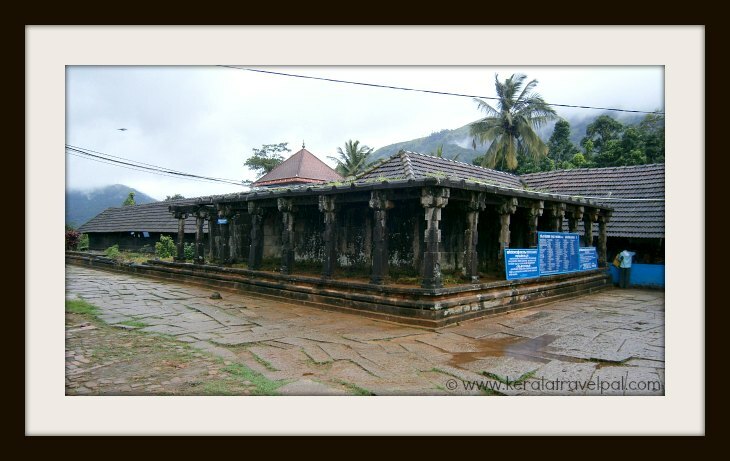 Thirunelli temple and surrounding buildings appear custom built deep inside thick forest. Road to Thirunelli is through the forest. The forest road, at times, is shared by elephant herds as well as other animals. Sighting monkeys, bison and deer is usual. The temple is an architectural marvel. Something else that may capture your attention is the sheer number of devotees taking up all the trouble to reach here. The car park gets full even at 6.30 in the morning! Many devotees reach here with serious intentions – to offer rituals for ancestors and to wash away sins at Papanasini, the holy stream. Thirunelli has the distinction of being the only temple where one could perform the whole range of rituals pertaining to birth, life, death and even after. Info about the beginning of Thirunelli temple is not very clear. History credits Chera king Kulasekharan (A.D 767 and A.D 834) for its construction. A couple of copper plate inscriptions belonging to the 10th century mention about Thirunelli and the temple there. However, the generally held view is that the temple is much older than that. As per Hindu beliefs, Lord Brahma found the statue of Maha Vishnu here. He created the temple at the same spot as a token of reverence. Even today, the sixth puja (worship) material is held aside for Brahma. The priest conducts five pujas (worship) daily. He also prepares materials for the sixth puja and keeps it aside. Using those materials, Lord Brahma is supposed to conduct the sixth puja late at night, inside the closed temple. The temple is spectacularly set atop a small mount surrounded by valleys and larger hills, all filled by dense forests. The sanctorum with tiled roof is as per Kerala architecture, although pillars near the outer walls are notable exceptions. Blending well into the background of misty mountains, the temple casts sanctity amidst striking scenery. Papanasini is a small mountain stream, about 500 metres from the temple. As per Hindu beliefs, a bath in Papanasini destroys all the sins the person committed. Papanasini River reaches into Kabani River. The temple pond (padmatheertham), the rock on which offerings to the deceased are made (pinnappara) and the cave temple of Lord Shiva (Gunnika) are other pilgrimage significant spots in the vicinity. Temple management offers accommodation for devotees in their guest house. KTDC managed Easy Hotel is about a kilometre from the temple. There are several small lodges and home stays not far from the temple. 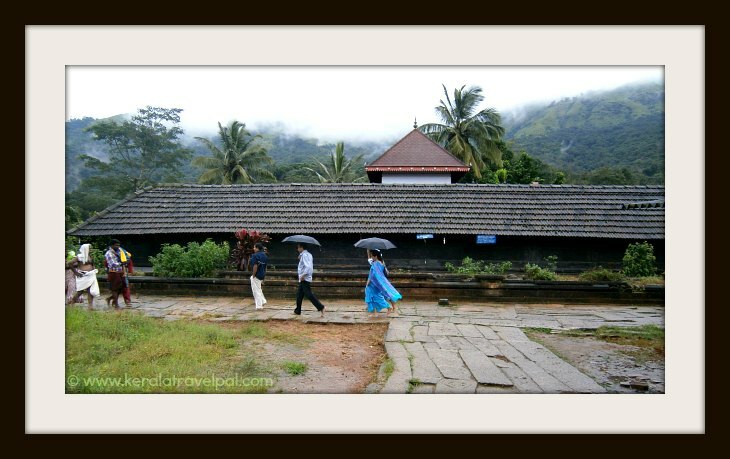 While staying near the temple is ideal for pilgrims, Mananthavady town is a better option for tourists. Average, value for money range accommodation is available. Thirunelli is about 32 kms from Mananthavady town. Proceed through Mysore road. Thirunelli direction boards are erected at intersections, so reaching the temple should not be hard. Avoid driving at night because elephant herds take over the road. For prayers and offerings, Temple is open during 5:30 A.M - 12:00 noon and 5:30 - 8:00 P.M.
Tholpetty sanctuary and Pakshipathalam are two major tourist spots in the region. While Tholpetty is easier to access, Pakshipathalam is an adventure trek destination that requires prior permission from forest authorities. Pazhassi monument at Mananthavady town, is the spot where King Pazhassi suicided to escape capture. The monument also has a tiny museum. The Flower Garden is only a few kms from Mananthavady. Worth visiting if the flowers are in bloom. So check before you go.